We have an old English pine wash stand that was our very first antique bought 21 years ago. I love all the old tiles that are still intact and unbroken. We love to dress it up with a little Americana. Jenn lives on a fifth generation farm in Dover, New Hampshire. I even love the little tag so I left it on to dress it up. 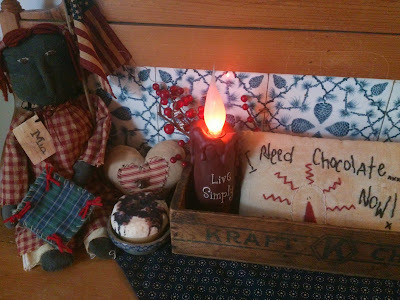 Buying old and handmade objects just appeals to me. 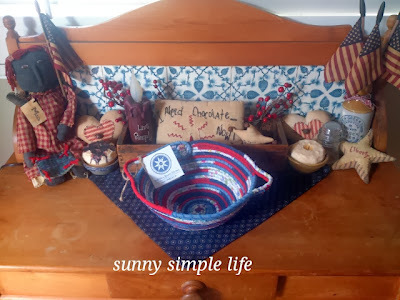 The little basket will be cherished and passed down. 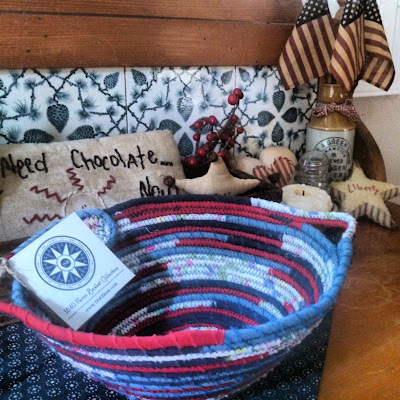 You can see Jenn's egg baskets and other handmades at her Etsy shop. You know I think Jenn is living my life up there on her New England farm. Have always felt I was meant to live there. That is a nice basket! Ilike how you have dressed up your old washstand. Neat rag doll! I have a vintage washstand a lot like yours with the tiles on the back. Love your new basket. Beautiful work. Darling basket, Elaine! 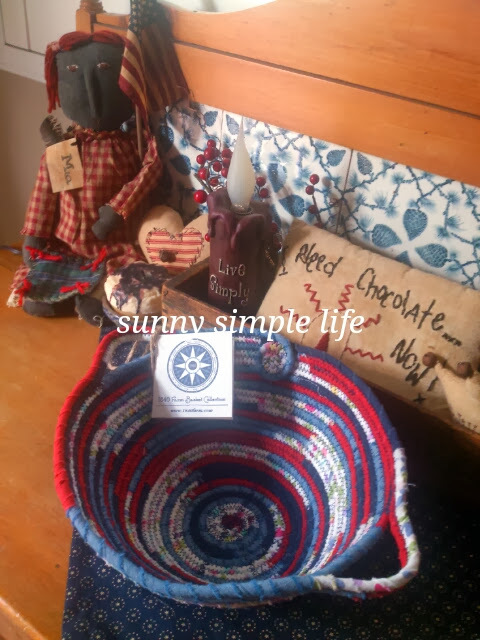 I love handmade items. They make our home cozy and unique! Etsy gets me into trouble! LOL I just had chocolate! I love that little hand-stitched sign. I love that piece!! And I love the egg basket!!! Thank you for sharing! I love the way our basket looks nestled among your beautiful collection of Americana. The washboard is beautiful. It would be right at home here in New England! I love the way you guys decorate! That basket is so pretty. My husband and I saw some like that the other day - I live in NH too - I wonder if they were her baskets?? Now I wish I'd bought one! I'll have to check out her Etsy shop. Thanks for sharing.